The Worlds: Dog is actual dog breed. Who knew? Y'all know Dog, the creature from a distant galaxy who visited Earth recently. Conor Cunningham drew the image you see at left, and I've used it in all my posts about Dog. But unbeknownst to me, Conor used a real dog breed for the image. 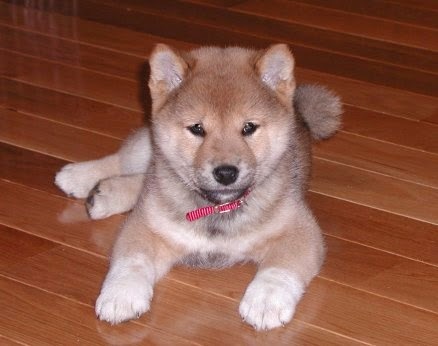 It's called a shiba inu. Down below on the right is a photo I found at Wikipedia Commons, taken by this cute puppy's owner, Mrs. L Selle. Is he a little darling, or what? I've been thinking about getting a dog. Wouldn't it be fun if I got one of these and hung a gold peace sign around his neck? And of course, I'd name him Dog.